I am on a plane to Cincinnati now for the USAW Weightlifting National Championships! Excited/nervous/anxious. I can't believe it's already time! This will be my first time at Nationals, and competing at this level, in anything. I will be lifting as a part of the Catalyst Athletics Weightlifting Team. I'm excited we qualified a women's team this year! SCHEDULE: All times are in EST. After Portland, I went to Houston for a customer onsite. With my special needs for this month leading up to Nationals, I had to find a gym that would let me do custom workout. Lucky for me, the search was easy and I found a CF gym within walking distance! Thank you CrossFit Roughnecks! 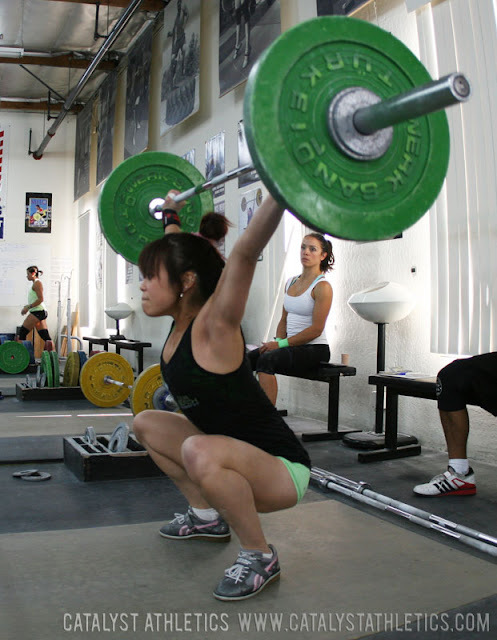 Lately, I've been doing more Olympic weightlifting at Catalyst Athletics. One of the most common feedback I got from coaches was "set your back!" Soon enough, it was clear that my back strength was far behind and possibly even limiting PRs. So about a month ago, Steve put me on their 4-Week Leg Strength Block 1 cycle and holy cow, it did wonders!